Home / Blogger Tips / Blogger Vs Wordpress - Which Platform Is Better And Why? 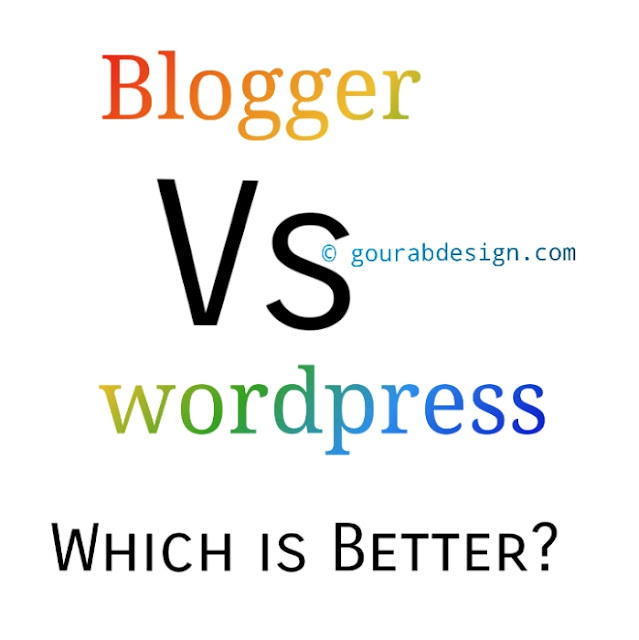 Blogger Vs Wordpress - Which Platform Is Better And Why? There are many websites based on blogger platform that generally provide their services for free. For now, there are 2 most used blogging platforms. These two blogging platform websites are Blogger.com and Wordpress.com. On this gourabdesign.com site, the blogging platform that will be used as a learning media for blogging is blogger.com. For wordpress blog, if you want more information, take advantage of Google search. Wordpress as a blogging platform here is Wordpress.com, not Wordpress.org (self host). WordPress itself has 2 versions, namely the free version (Wordpress.com) and the Self Host / paid version (Wordpress.org). Wordpress.org is often regarded as one of the blogging platform websites. In the real sense, this is not true. Wordpress.org is not a blogging platform but a website that provides CMS (Content management system) source code for creating and managing Websites. If you visit wordpress.org, there will be a download link for the source code that you can later install on a hosting. The website that was built with the CMS from wordpress.org will have an admin interface like the one found on wordpress.com. The thing that distinguishes wordpress.org and wordpress.com is that you will get more customization and are almost not bound by any conditions. Yes, this is clear because what you make is not a blog but a website with a wordpress CMS. Blogger.com (can also be accessed with blogspot.com) is a free blogging service that was initially launched by a company called Pyra Labs in 1999. In 2003, blogger.com was acquired by the Google Company and continues to grow over time and has become Free blogging services are the most widely used for now, especially for bloggers in Indonesia. Custom Domain Support . check blogspot domain price for internet for better understand. Integrated with Google Adsense and Google+. blogger price per cost is free lifetime. Almost all the features needed to build a professional web page can be found through Blogger.com. On blogger.com, all features we can get for free without any restrictions that require us to upgrade (pay) first. We don't need to spend hosting fees per month to keep blogs online. In this case, blogger is hosted on a google server which certainly has very good quality. Very rarely (personally, never before) I found it down on the blogger server. Blogger is a blogging platform website owned by the giant Google company. In terms of security, blogger.com is very reliable. Today, we know that Google is a large company that (most of their products) is engaged in online with a variety of services. Here, the issue of credibility and security is clear. We might not get this even if we use the Self Host website (own / paid hosting). Lately, several updates have been made on blogger.com. This update is in the form of additional features, dashboard interface upgrades, theme availability and several others. Now, blogger.com has provided an https connection for each blog that uses their subdomain. Reviewing this, it is probable that the features found on blogger.com will continue to increase. As mentioned earlier, on this gourabdesign.com blog, the blogging platform used as learning material for blogging activities is blogger.com. In the next material, we will start creating a blog on blogger.com.